Google is making a play for the videoconferencing market with a tailored solution designed to let businesses hold face-to-face meetings over its collaborative Hangouts service. Called Chromebox for meetings, it's driven by a Chromebox that packs an Intel Core-i7 CPU. On its rear are HDMI, VGA and DisplayPort connections for hooking it up to an external TV or monitor, alongside two USB 2.0 and 3.0 (four in total) ports and an Ethernet connection. The package also includes a full-HD webcam (Google held back from disclosing the manufacturer, but it has more than a whiff of Logitech about it) that totes a Carl Zeiss lens with autofocus and low-light correction. That's supplied with an RF-based remote control and speaker unit that houses an in-built omni-directional microphone. Fully integrated with Google Apps, meetings are set up as Google Calendar appointments that can be joined by other Chromebox for meetings users or by logging into Google's Hangouts app on a mobile device. So long as they have a Gmail address, up to 15 participants can join meetings, and rooms with traditional video conferencing systems can also connect using third-party tools from Vidyo and Uberconference. 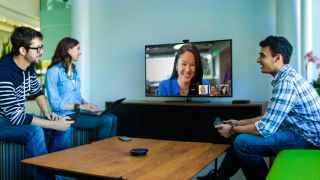 Google reckons the service is more accessible than traditional hardware-dependent videoconferencing systems due to the familiarity of Hangouts with existing users. Whoever is speaking at any one time is automatically shown full screen, while other participants appear as thumbnails in the bottom right-hand corner. A management console allows meetings to be held privately and participants can be removed. Chromebox for meetings has launched in the US for $999 (around £611/AUS$1114) and will make its way to other markets with pricing to be revealed soon, according to Google. That cost includes the hardware and 24-hour, SLA-driven phone support for 12 months, after which time an annual renewal fee of $250 (around £153/AUS$279) kicks in. Mark Van Der Linden, Google Enterprise Country Manager for the UK, told TRPro that the search giant is aiming to "democratise videoconferencing in the workplace," with Chromebox for meetings. He said: "People are used to using videoconferencing at home, but in the office it's expensive and complicated. A combination of Google Hangout tech and a Chrome device has allowed us to keep things affordable."